Daw Hay Mar, a trader, can only shake her head when talking about the high expenses she incurred in constructing a storage building and workers quarters because of poor workmanship. She said her nightmare started when she hired a group of construction workers in her neighbourhood for the job. Daw Hay Mar said the building they erected looked like a patchwork of concrete and steel, so she asked another set of workers to redo the job, doubling her expenses. “We hired them as we are neighbours, and I thought that since they are working in heavy construction sites they have the basic skills to construct a simple building,” Daw Hay Mar said. According to industry insiders, the country’s construction industry is suffering a severe shortage of skilled workers, such as engineers, bricklayers, mason, carpenters, as most highly trained workers have sought better-paying jobs abroad. Skilled workers who are still in the country are working full-time for big construction firms, which have ongoing projects. Ko Han Si, an electrical worker, has been a daily wage worker for Township Electricity Supply Corporation in Yangon Region for over four years, and is now ready to leave for work abroad despite having to leave behind his wife and one-year-old son. “Here, we have no holidays. I only earn K4800 (US$3) a day. If I work abroad, I will get a much higher salary and I don’t have to shoulder the cost of daily living expenses so I can send money back to my family,” he said. Ko Han Si said he will be doing the same job he is doing now as an electrical worker for a construction company where his friend has worked for over five years now. He will be paid US$560 a month, much more than the US$90 he gets at his present job. Another construction worker, Ko Min Thurein, who works in South Korea, earns about 150,000 won (K213,000) a day. He said he will work there for two years more to save money, although his employment contract has expired. Ko Min Thurein, from Sittwe Township in Rakhine State, said he went to Seoul under the Employment Permit System (EPS) agreement between Myanmar and South Korea, which provides a five-year contract. “I decided to continue working here because I have to take care of my family,” he said. He said that working at high-rise construction sites in South Korea is different from working at similar ones in Myanmar. Ko Min Thurein said he feels safe working in South Korea because of the facilities and equipment they use on the construction site. The number of Myanmar nationals who want to work in South Korea is increasing. About 30,000 prospective workers sit for the Korean language proficiency test under the EPS every year. Most workers going to South Korea prefer to work in the construction and manufacturing industries because of the higher pay. According to the Myanmar Ministry of Labour, about 25,000 Myanmar workers leave each month for the eight countries with which the government has labour agreements. Thousands more leave to work in countries where the government does not allow citizens to work. Most Myanmar migrant workers go to Thailand – an estimated 20,000 every month. 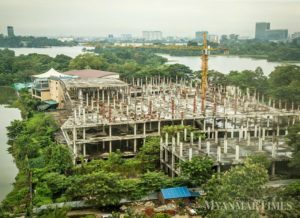 U Kyaw Zaw, general secretary of the Myanmar Overseas Employment Agencies Federation, said there is a strong demand for construction workers in Thailand because of the expansion of the country’s tourism sector, which has resulted in the construction of more hotels. There is also strong demand among garment factories in Thailand, which waive the broker fees of skilled workers they hire, U Kyaw Zaw said. “Migration is based on money. The value of Myanmar’s currency is lower than Thailand’s, which is why Myanmar workers go to Thailand,” U Kyaw Zaw said. Local construction firms admit having difficulty matching the facilities, benefits, and salaries offered by foreign companies. “We have workers who could be skilled labourers and leaders, but they work here just to get experience, then they go to South Korea to work. So we lose them after they acquire skills,” said electrical engineer Daw Phoo Wai Wai Thaw, owner of WAI-Electrical Group Installation and Engineering. New engineering graduates also work for local companies just to build up their portfolios. After that, they go abroad for the better pay and benefits. “It is not true that they are going abroad because don’t want to use and share their skills in Myanmar. They leave the country because they need to take care of their families,” Daw Phoo Wai Wai Thaw said. Contractors admit building projects are being delayed because of the skilled-labour shortage, which forces them to rely on trainee workers. After the transformation of the education system in Myanmar in 1988, the production of skilled engineers declined, although there were more engineering universities, U Yan Aung, general manager of Asia Builders construction company, said. He said that more practical training of workers is needed at engineering universities. “The construction industry would grow again if we could give enough training to general workers,” U Yan Aung said. U Yan Aung said the local construction industry cannot compete for skilled labourers with the facilities and wages offered by companies abroad. Efforts by the Myanmar government and non-governmental groups to upgrade workers’ skills have been unable to fill the domestic demand for skilled labour. At the forefront of the government’s skills programme is the Myanmar National Skills Standards Authority (NSSA) founded in 2007, which has programmes to upgrade skills in 23 industries. But only about 8000 workers have been tested and issued skilled labour certificates by the NSSA so far, 2000 of them in the garment sector. According to a recent survey of the country’s workforce, 22 million people are eligible to work, Labour Minister U Thein Swe said. NSSA officials and contractors said that many of Myanmar’s skilled workers have missed job opportunities in construction and factories because they failed to get skilled labour certificates from the NSSA. U Ko Ko Naing, an adviser to the German Agency for International Development Cooperation, which provides support to the NSSA, said that while there are many skilled workers available, foreign companies would not hire them because they do not have NSSA certificates. “Also, some of our workers migrate to other countries when they have acquired skills,” he said. Although there are many free or paid vocational training courses in the country, workers have difficulty attending them because they have to work long hours to survive. Unless the government and private sector find ways to address the skilled labour shortage, the country’s economy may remain in the doldrums and economic development will remain a pipe dream.